Rafting down a forested river is considered a nice relaxing way to spend a summer. Set up camp each night and cook yourself something over the fire, maybe even break out the guitar for a few songs. The Flame in the Flood paints a different picture. The old America is dead, overgrown, and fast being forgotten, you must stay ahead of the changing seasons and the coming rainfall by rafting down a procedurally generated river, crafting equipment and foraging supplies as best you can. If you die you have start all over again. Molasses Flood’s a team made up of ex-Bioshock, Halo, and Guitar Hero developers, including Bioshock’s art director. they’ve created a world inspired by the Mississippi Delta, Louisiana Bayou, and other places, all chosen to evoke the American wilds. While the art style looks cartoonish the mechanics underpinning the Flame in the Flood are harsh and brutal – you can starve, freeze, get ill, and, if you’re really unlucky, get eaten. You can string your raft up to the shoreline and go foraging for food and firewood, make camp, and repair your craft. But, you need to make sure you stay ahead of the rain. Autumn is coming and it will sweep the land with flash floods. If you’re caught up in them the river will swell and become a dangerous place. The team put a lot of emphasis on the illnesses you can contract in the game – “Snake bites, fatigue, hypothermia, open wounds, and infection are just some of the ways the world will try to kill you,” they say. Everything can be cured but you’ll need to find the ingredients for the remedy or someone willing to trade you a cure. The wilderness AI sounds particularly interesting: “NPCs behave according to rules governing hunger, fear, aggression, and territory.” So you might walk safely by a pack of wolves one time but they’ll turn and pounce on you the next simply because that time they’re hungry. Your constant companion is a dog called Aesop and he ties nicely into the permadeath mechanic that greets your failure. If you die you have to start again, losing everything. Everything, that is, except for what Aesop was carrying at the time. 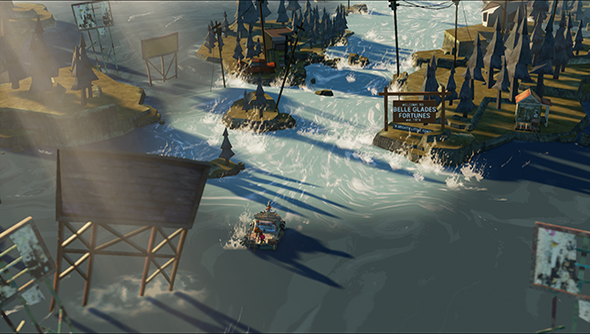 With 29 days left on the timer, The Flame in the Flood’s Kickstarter campaign is racing along: it’s already raised more than $55,000 or its $150,000 target. There’s still a lot of details waiting to be fleshed out over the rest of The Flame in the Flood’s Kickstarter campaign but it’s already looking intriguing.